There has been several times in this life as a technology journalist when expanding my wireless network would have helped what I do. However, as is usually the case, my single wireless connection in my device is the one picking up the other Wi-Fi available, and cannot be used as an access point itself. Similarly, in a home, using a device to temporarily extend a wireless network for a better connection has obvious uses. Rivet Networks, the company behind the Killer networking controllers, now has the hardware and software in place for its Killer AC 1550 module to both connect to an access point and become an access point without an additional radio. Extending a network without laying cable is typically done through Wi-Fi repeaters, extenders, or powerline adaptors with additional wireless radios. In order to get additional coverage, more radios are needed. Rivet Networks believes that the wireless modules within a PC can help bridge the gap, by making them act as access points to the network without the need for additional hardware. 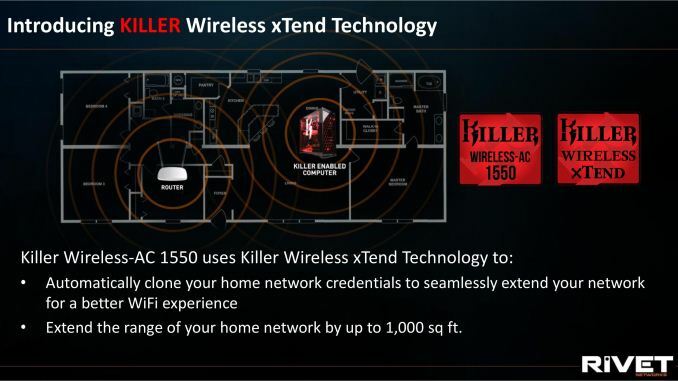 What Killer xTend on the AC 1550 does is, either by connecting with wires or wirelessly, will extend the network by creating an additional mesh point with the same SSID and password. With the Wi-Fi in and Wi-Fi out mode, the radio performs its duty in a time slicing multiplexer/de-multiplexer mode, giving both the incoming and outgoing signal 50% of the time but maintaining both. 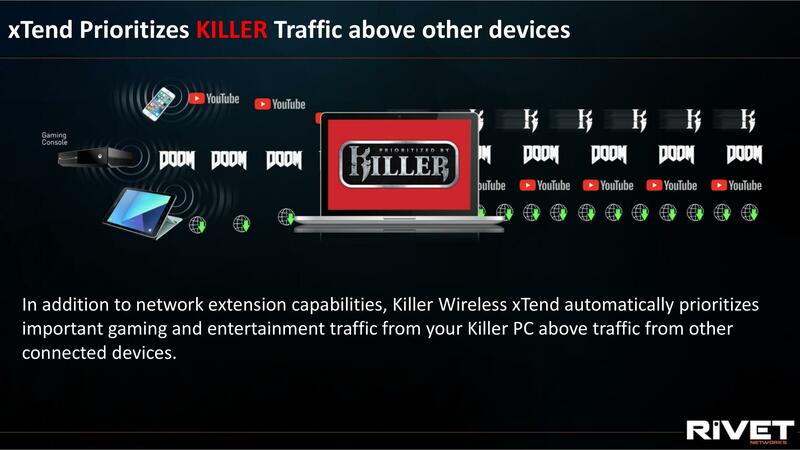 On top of this, Killer can implement its prioritization protocols to enable sustainable gaming performance on the Killer machine when others are streaming or downloading. With all the devices connected through the Killer PC, their traffic will default to a priority four, while the Killer PC will keep its priority levels for its traffic (which can be adjusted). 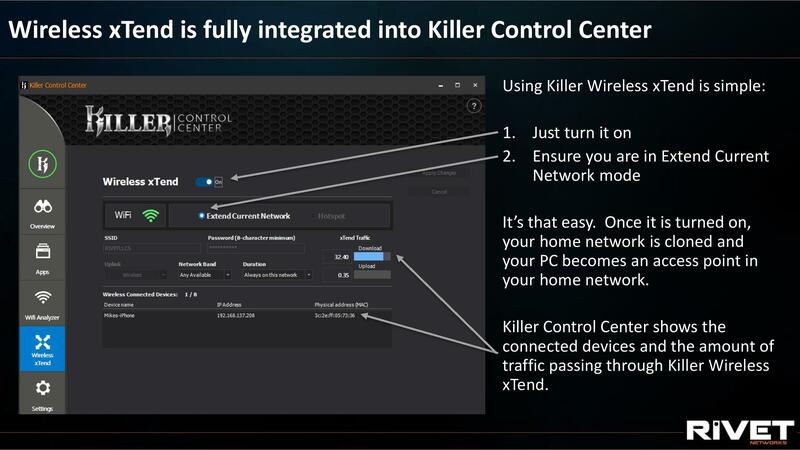 Up to this point, Killer xTend has been enabled on motherboards with multiple wired network ports, allowing users to connect nearby consoles and Ethernet storage to the same network through a single machine, but now the xTend philosophy can be invoked through wireless connections. It should be noted that a Killer wired connection is required if the input from the main DHCP router is through a physical connection. The interface is designed to be simple, with users available to extend the network (in Wi-Fi mode), or create a wireless hotspot (in wired and wireless mode). Users can adjust between 2.4 GHz and 5 GHz modes, as well as define an SSID and password in the wireless hotspot mode, however other standard networking features are on the to do list. Connected devices can be seen, with a maximum of eight supported. Currently the interface shows the total traffic of the connected devices (not the host system), and there are plans in the works to improve the configurability of this. 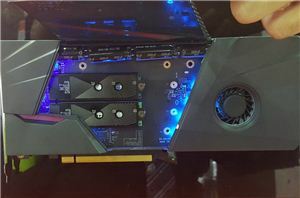 As with the previous announcements like this, the main drawback is the loss of the connection when the host machine is in a sleep mode or turned off. The response to this from Rivet Networks is that this feature is not designed to be as a replacement for a proper home mesh – the point is that nearby devices can connect to the laptop or PC in a room and all piggy back off of a single signal to the wireless router rather than relying on their own connection as it adjusts when they move about with their own smartphones and such. The way Rivet is promoting this technology is to turn around and say that the AC 1550 works as normal, but this is an extra feature that can be used if needed at no additional BOM cost. From our perspective, such a device allows a single editor at a show to give a hotspot to everyone, if they are the ones that have paid for the hotel Wi-Fi (because in the US, it usually isn’t free for some reason). Or if one of our editors does not have a local SIM card, it solves that issue. This is more of a by-product of the feature, but a positive that I can use either way. 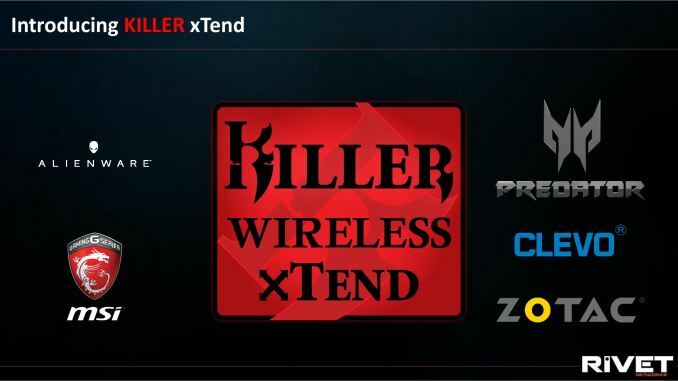 Partners on board with the Killer Wireless xTend feature include Dell, MSI, Acer, Clevo, and Zotac, who is a new customer with Rivet and we might see some new mini-PCs with Killer networking at Computex this week. 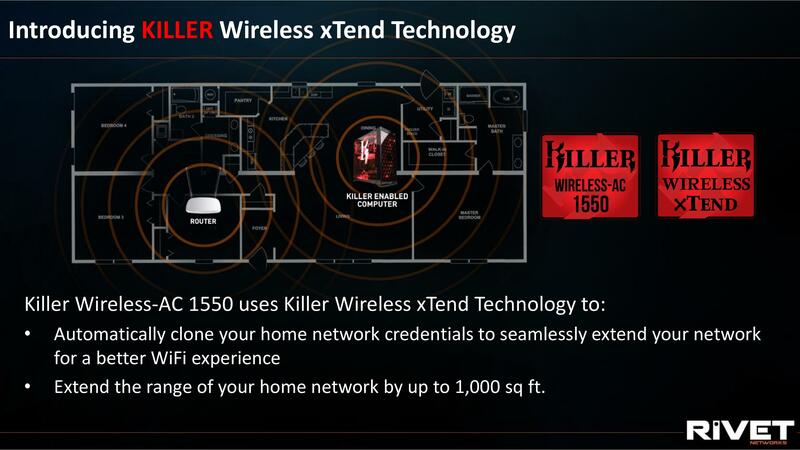 The Killer xTend Wi-Fi tool will first be available for users with the latest AC 1550 module, manufactured by Intel. 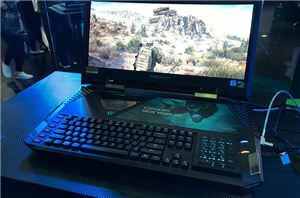 If you didn’t catch the story that Intel is now making the Killer modules, check out our coverage here. The software will also be available for AC 1535 users, such as Dell XPS users, at a later date. It's literally the second to last line of this article and includes a hyperlink. 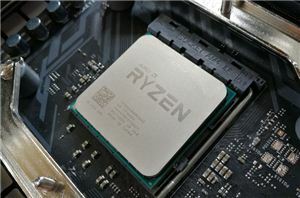 It's been all over Anandtech for a while now and on other tech news sites too. I'm not sure how much closer to the water your horse can be led at this point without us drowning it while we attempt to help it drink.